Valentine's Day is just around the corner and I wanted to share with you a treat that I found a tutorial online for so I decided to make one. Then I was inspired to make a card to match. For this project I used the new Soda Pop Tops from the new Spring Mini Catalog. Accessories: Honeycomb Embossing Folder, Soda Pop Tops, Basic Rhinestones, Ticket Duo Builder Punch, Blossom Punch, Small Heart Punch, 1" Circle Punch, Paper Snips Scissors, Big Shot Machine, Scallop Square Bigz Clear, Mini Glue Dots, 3/8" Brights Glimmer Brads, Cherry Cobbler Baker's Twine, 1/16" Circle Handheld Punch. 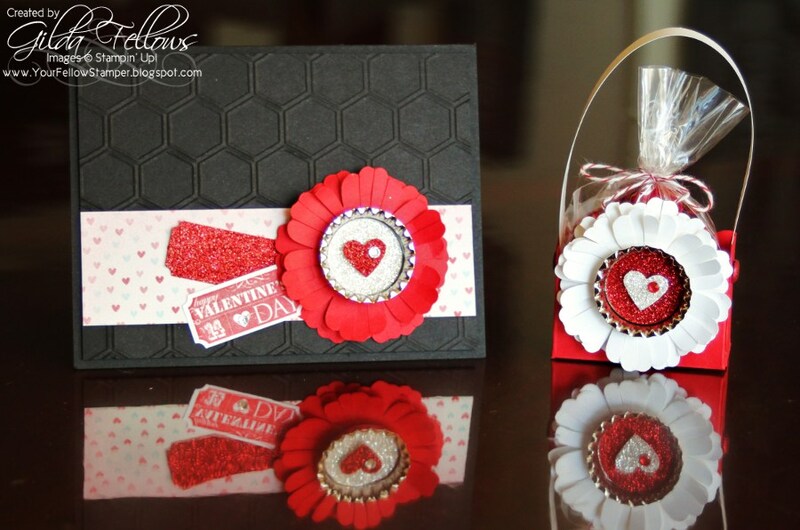 Just love your Valentine treat bag. It's so adorable!! Thanks for sharing.